Nebraska Truck Center, Inc. is pleased to offer students, who wish to become medium, and heavy duty truck and diesel technicians, an opportunity to attend Central Community College (CCC) in Hastings, Nebraska by offering the Nebraska Truck Center, Inc. Student Sponsorship Program. The Nebraska Truck Center, Inc. Student Sponsorship Program allows us, as a Freightliner and Western Star medium and heavy duty truck dealer in Nebraska, to offer numerous student sponsorships that will allow selected applicants the opportunity to earn a two-year associates degree in diesel technology. The sponsorship provides funds to cover tuition and book fees, along with a $5,000 tool allowance. The two-year sponsorship support is worth an estimated $14,000 to the selected students. We believe this program will enable the students to be prepared for a long-term career (not just a job) at Nebraska Truck Center, Inc. In addition to the above assistance, we will also offer the students summer intern positions that will allow them to apply hands-on skills in one of our two state-of-the-art certified service departments. Visit the Central Community College campus at Hastings. Complete an application and be accepted to Central Community College and provide all necessary high school transcripts and successfully complete any tests required. Complete the online application for the Nebraska Truck Center Sponsorship. Take or have taken school-provided COMPASS or the ACT test. Finalists for the sponsorship program will be invited to interview with our selected service management personnel. 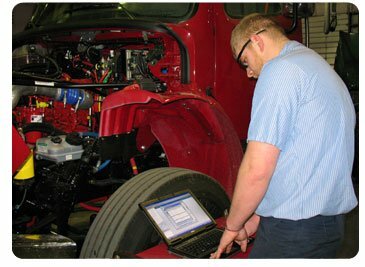 Nebraska Truck Center will contact student finalists to arrange interviews. Sponsored students must agree to work for Nebraska Truck Center for a minimum of 4800 hours upon completion of their associate’s degree.